The September issue of the Bulletin has now been published and is available. Below is the table of contents of this issue, which includes a panel of papers emerging from an AAR/SBL Panel on Religion Past and Present. This issue also includes articles exploring the intersection of ancient religion, specifically with a focus on a recently published text by Galen. We also have a study of disruptive narratives, applying literary theoretical models to modern fictional re-imaginings of Jesus as a narrative figure. 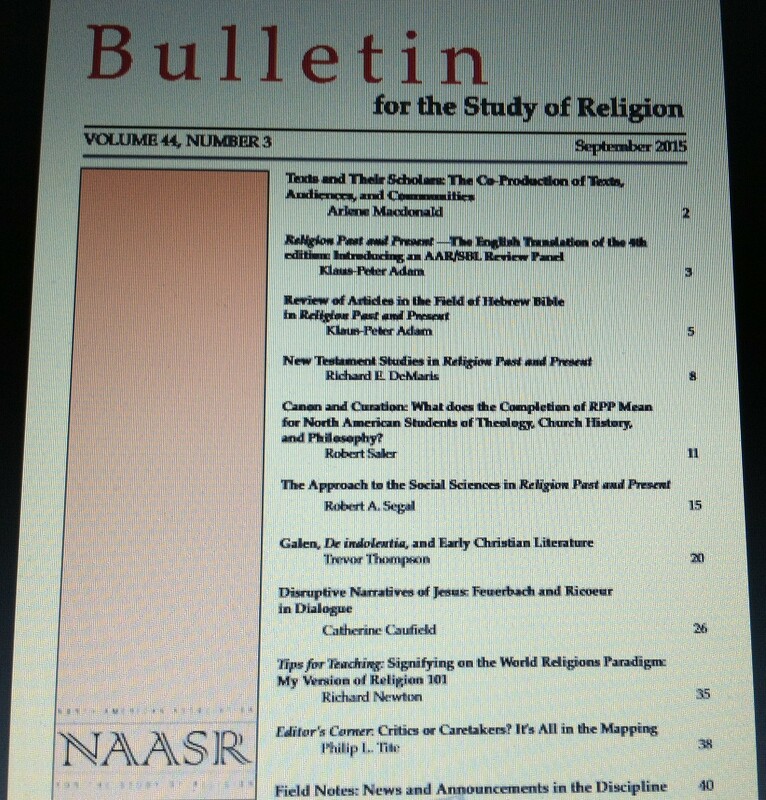 This issue of the Bulletin also includes another “Tips for Teaching”, this time exploring one innovative approach to teaching world religions beyond the world religions paradigm. A new section is launched in this issue of the Bulletin with the “Editor’s Corner” (an occasional section of the Bulletin where the editors offer provocative musings on theoretical challenges facing the discipline). Finally, we are pleased to include in our “Field Notes” section the program for the annual meeting of the North American Association for the Study of Religion (NAASR). This entry was posted in Announcements, Pedagogy, Philip L. Tite, Religion and Popular Culture, Religion and Society, Religion and Theory, Theory and Method and tagged AAR, American Academy of Religion, Annual Meeting, Arlene Macdonald, Bulletin for the Study of Religion, Caretakers, Christianity, Critics, De indolentia, Editor's Corner, Feurbach, Field notes, Galen, Hebrew Bible scholarship, Klaus Peter Adam, NAASR, New Testament scholarship, North American Association for the Study of Religion, Paul Ricoeur, pedagogy, Philosophy of Religion, Religion, Religion Past and Present, religious studies, Richard Newton, Ricoeur, Robert A. Segal, Robert Saler, Russell McCutcheon, SBL, scholarship, Sociology of Religion, teaching, Trevor Wade Thompson, world religions, world religions paradigm. Bookmark the permalink.